Well it Wednesday which means only one thing it's time for the new challenge to start over at creative moments. 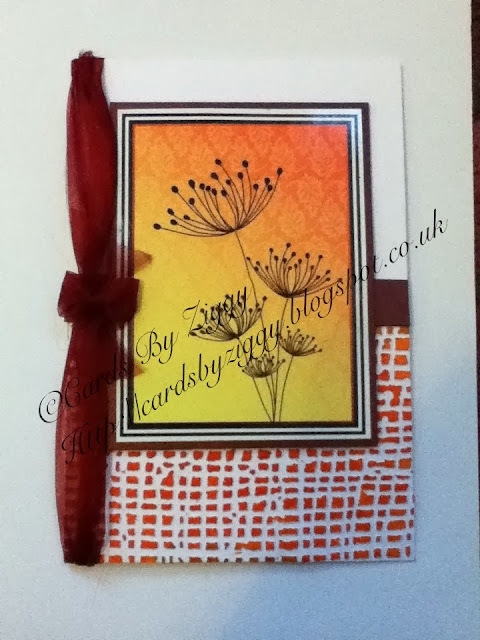 I chose the digi stamp that looks like the silhouette of a dandelion clock, our theme was Halloween/bonfire night so I took my inspiration from the colours that are always around, oranges and yellows and made a blended background for the stamp, I also used a leave mask to add some more interest. If you like what you see and would like to see some more inspiration and enter click the creative moments icon on the left. You've created a gorgeous background, the colours are beautiful. A lovely card. This is fabulous Ziggy, I love the background and the colour. The stamp is gorgeous. I am a new follower and loving your blog. So pretty! I love the fall colors and leaves background. Thanks for playing along with us this week at Craft-Room Challenge. Fabulous cards and beautiful coloring! Fabulous cards, loved the colours and image of the first one.